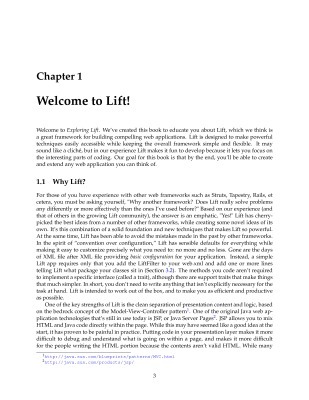 This is the home page for Exploring Lift, an open source book providing in-depth coverage of the Lift Web Framework. The book is downloadable for free on this website in both PDF and HTML formats, as well as an online version of the HTML format. If you have any questions or comments about the book itself, please feel free to join us on the mailing list. If you find errors in the book, please open issues up at our issue tracking site. Design © 2008-2010 adapted from the Titan Theme by The Theme Foundry.